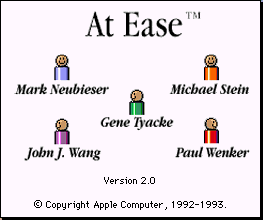 I have written about alternate desktops for Windows and other OSes before, but I recently discovered an interesting alternate desktop for the Apple Macintosh called "At Ease". It is a simplified desktop designed to restrict users from tampering or altering a Macintosh system and limit them to the use of only designated applications. In other words, this is probably not something you would want on your own personal Macintosh desktop but it would be very useful for Macintoshes running in public places, such as classrooms or libraries. Interestingly, this is not a third party desktop, it was actually made and sold by Apple. With At Ease installed and active, At Ease will start instead of the Finder when MacOS starts up. 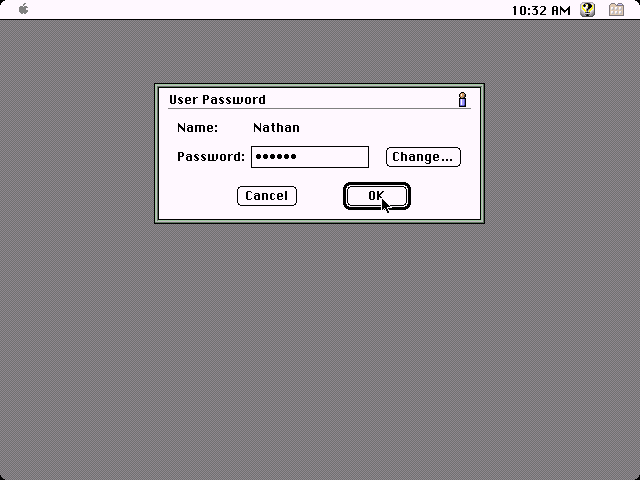 These screen shots are taken with MacOS 7.5.5 running under Basilisk II. At the welcome screen you select the user you want to log in as. Different users have different profiles and can have different access levels. Passwords are optional, but if one is specified then the user must enter their password to access the system. None of this is real system-level security, but if the applications in use cooperate then it is fairly effective. 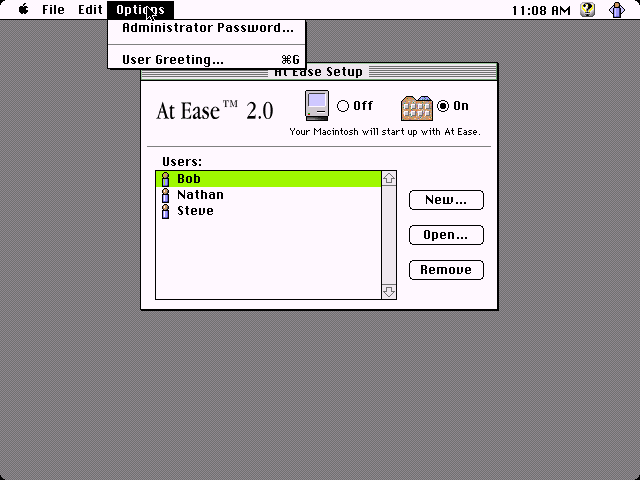 For a typical At Ease user the At Ease desktop will appear. 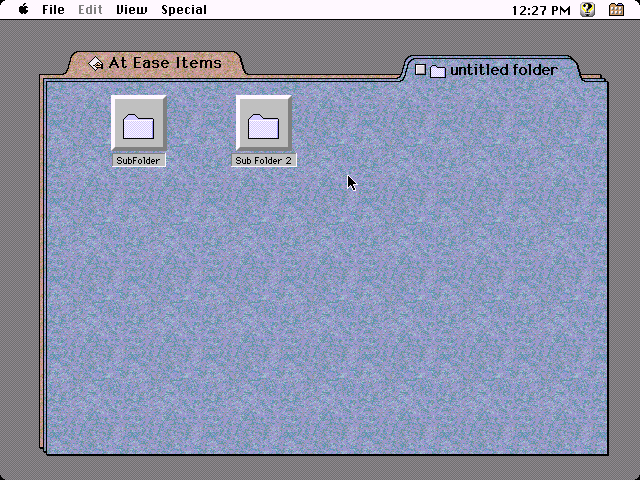 The first folder tab lists the applications on the Macintosh that the user has been granted access to use. Icons in At Ease are presented as buttons that only need a single-click to launch the application or file. A rather cool feature of At Ease is that it will optionally speak the names of the icons as the mouse is moved over them. It also has a few other sound effects used in various places. The last folder tab contains the users documents. Each user has their own private folder. On the most restrictive settings At Ease users can not create sub folders, delete files, or even rename files. They are also restricted from accessing items in the Apple menu as shown in this screen shot. When running an application, At Ease can attempt to prevent the user from saving files anywhere other than their documents folder. In this screen shot all locations other than the user document folder are grayed out. 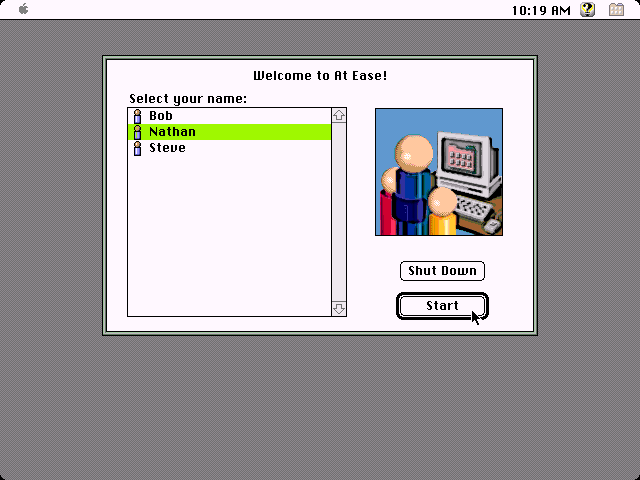 At Ease setup is used to add users or change permissions. It can optionally be locked down with an administrative password. This is usually a good idea if you want to prevent users from being able to give themselves additional permissions. After startup stay in At Ease or switch to the Finder. 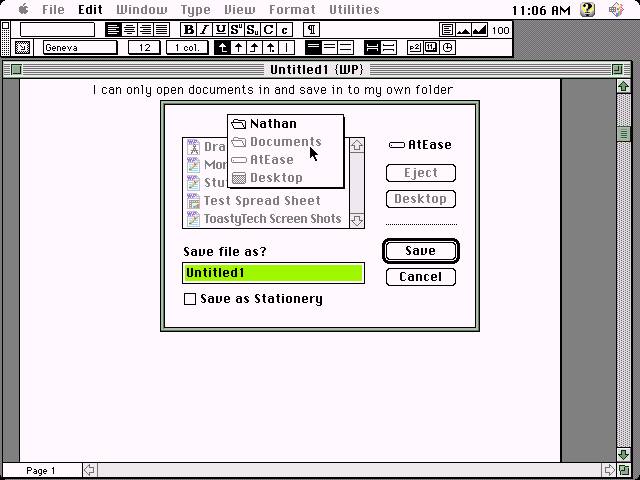 (Starting Finder gives them full control to the computer). 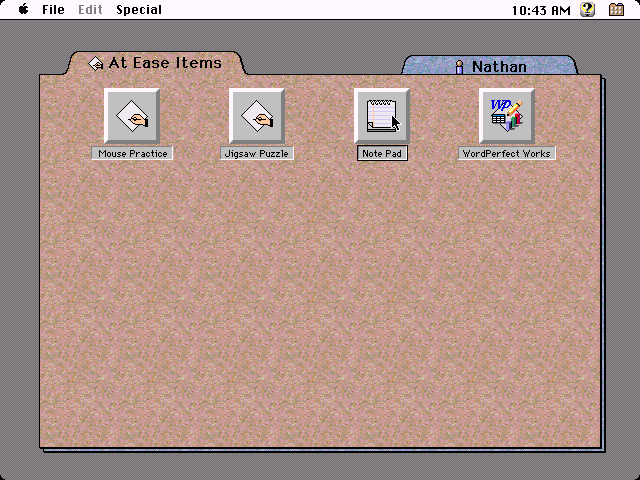 The applications or items that appear for the user in the main panel. Minimal or all At Ease menus. Selecting "all" menus gives the user access to the control panel, get info, new folder, rename, and delete through the At Ease menus. Speech: At ease will speak the button names when they are pointed to by the mouse. Allow users to open and save to anywhere, only in the user's folder, or only on a floppy disk. Enable or disable access to the finder through the At Ease menu. 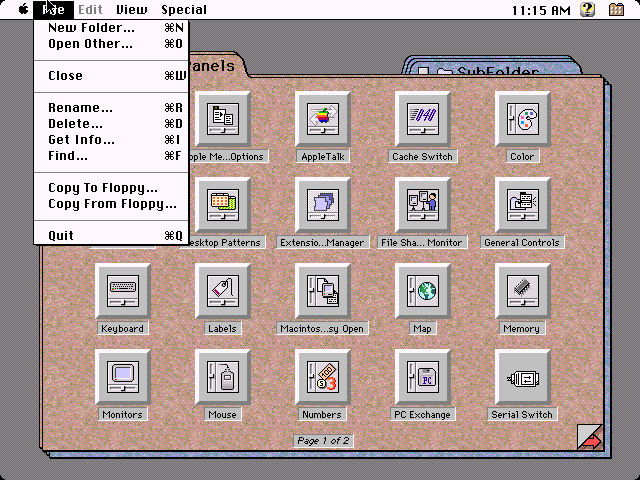 For users that can create folders, additional folder when opened appear as overlapping folder tabs as shown in this screen shot. The folder is closed by clicking on the small square button to the left of the folder name. 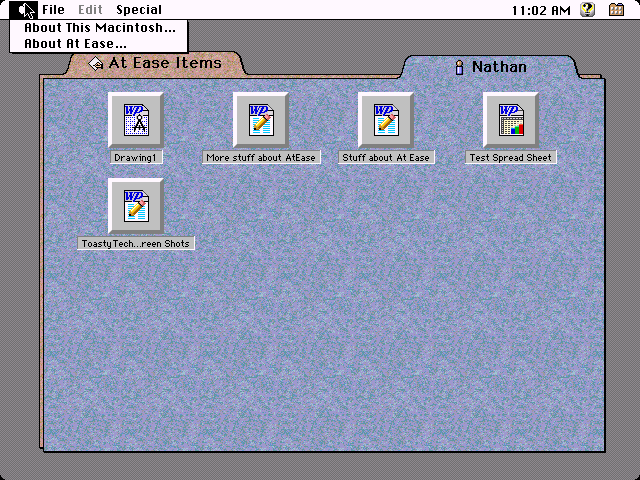 At Ease can display the control panel folder in an At Ease folder. 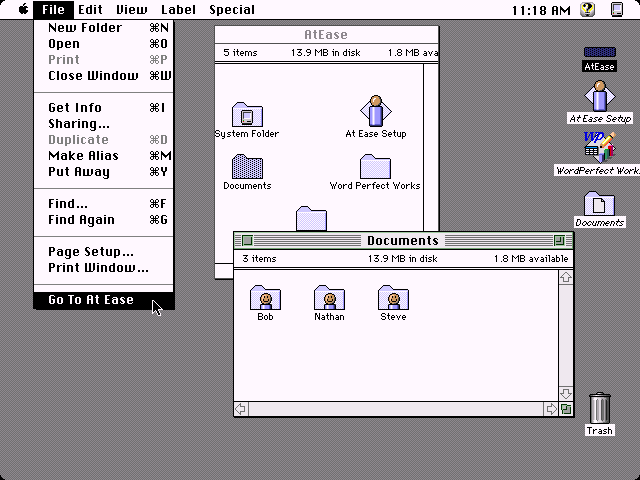 When the folder contains more than the number of items it can display at once, a next / previous page indicator appears in the lower corners of the folders. From the finder the user has access to the entire system. All files on the computer are accessible from the finder including those in the personal folders. Quitting the finder will return to the At Ease welcome screen where another user can log in.